Classic Super Mario games are pretty fun to play. However, if you happen to find controlling Mario, dodging obsicles, finding coins and defeating enemies on your screen all at once a bit daunting, perhaps you should try this homemade alternative. Super Pixel Bros by modder Brad Slattery makes the 1985 version of Mario even more pixelated, so you are now just one big, square pixel moving around other chunky pixels--in fact, Brad's version is limited to just 64 pixels. The aim of the game is exactly the same as normal Mario games, but you just need a bit of imagination as you move through the 20 replicated levels. 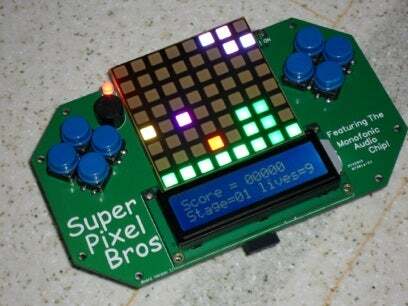 In addition to the game, Brad also created a hand-coded platform on which to play Super Pixel Bros. Vaguely similar to a PSP, the mobile console is made up of eight buttons, a 16-by-2 LCD screen for scorekeeping and 8-by-8 LED matrix for the game, a 1-bit audio chip to create sound effects and speaker, a circuitboard, and other typical things to make a platform work, like batteries and resistors. Each game level is 120 pixels wide, and was created using the levels source codes from the original Mario games. The game levels were drawn in Paint, then turned into binary with converter software. Brad has listed how to create the Super Pixel Bros platform and levels on his website, as well as useful links, for you to try out. If you want to just create your own similar levels for the platform, he is happy to upload it and put it on the page for others to download. Check out the video below to see how it all comes together.